A couple of years ago, as I got more and more intrigued by outdoor activities and combining them with travel, I found an article in an outdoor magazine about the most famous Swedish hiking trail, Kungsleden. It caught my interest and since then I knew that I, some day, would make this tour. At that point I did not know that I would, years later, marry a girl from Sweden that would share my outdoor interest and that we would, in the early approach of autumn 2014, hike the 107 kilometers from Abisko to Nikkaloukta. Kungsleden is actually longer than our chosen tour. It stretches for approximately 450 kilometers (275 miles), from Abisko as its most northern point to Hemavan in the south. This path is sometimes referred as the “north Kungsleden”, as there is actually a less known south part as well. What distinguishes Kungsleden and other hiking trails in the north of Sweden is that they pass trough one of Europe’s largest wilderness areas, they are far from any megacity and the nature is pretty much untouched. The Swedish outdoor-hospitality is also a reason to visit the country, even if for shorter tours. They have a general public right, known as Allemansrätten (everyman’s right), that allows public access to wilderness, which means that one can walk, bike, camp etc. on any land (except from private gardens, cultivations and with restrictions in nature reserves). Kungsleden lies north of the Arctic Circle, in Lappland, a province in the northernmost Sweden. This province, together with some parts of northern Norway, Finland and Russia, build up Sápmi, a cultural region of the Sami people. Along the trekking tour one can see traces of the Sami people, their summer-cottages from which the Sami herders watch over their reindeers until mid August. 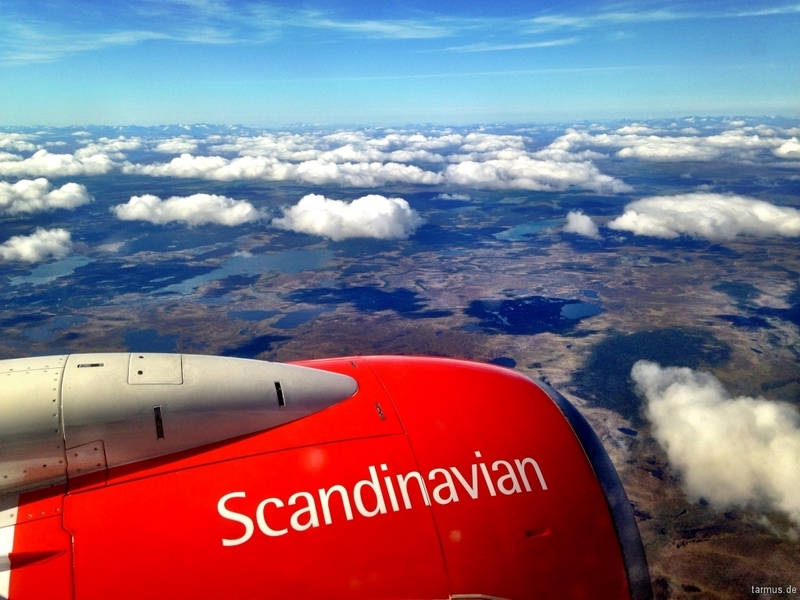 Unfortunately, we did not meet any Sami herders, due to our pretty late arrival to this region. The trail is famous and visited by people from all over the world. Perhaps the closeness to the nature attract the most, but another important part of why Kungsleden is popular is because it is a well organised trail. There are signs showing the way, bridges over quick streams, planks laid down on difficult grounds to ease the walking, emergency shelters and boat-services to get across some of the lakes. Every 20km or so, there are huts with accommodation for those who decide that they want to travel light. Some of the huts host a small shop selling food and other walking needs. 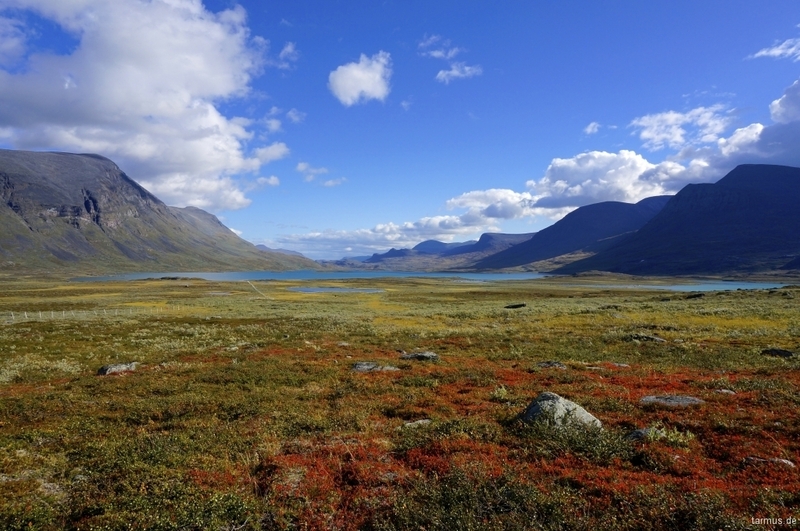 The best time to hike Kungsleden is from mid-June to mid-September. During that period the huts are open and a cottage-host is always present. The trail ist busiest during mid-July and mid-August, due to the long days and warm weather, but keep in mind that the mosquitos are at their peak then. Additionally, the famous organised trek, Fjällräven Classic, take place in the beginning of August each year, so the trail is crowded. Who wants to avoid the swarm of mosquitos, better choose the last part of August to mid-September, prepare for cooler nights but stunning autumn colours of the landscape. Kungsleden is not only about the hiking; it is also about the pure relaxation. When your tent is ready for the night and the dinner is cooking, you have time to enjoy the silence, the extraordinary views and the feeling of being in symbiosis with the nature. Even though some of the huts along Kungsleden have shops where one could buy food, we still brought enough food for nine days. This decision made our backpacks heavier but we were fully independent. Some hikers stated that the food ransom in the huts could be pretty low in the end of the season and thereby we did not want to take any risks. We paid attention to a varied diet. 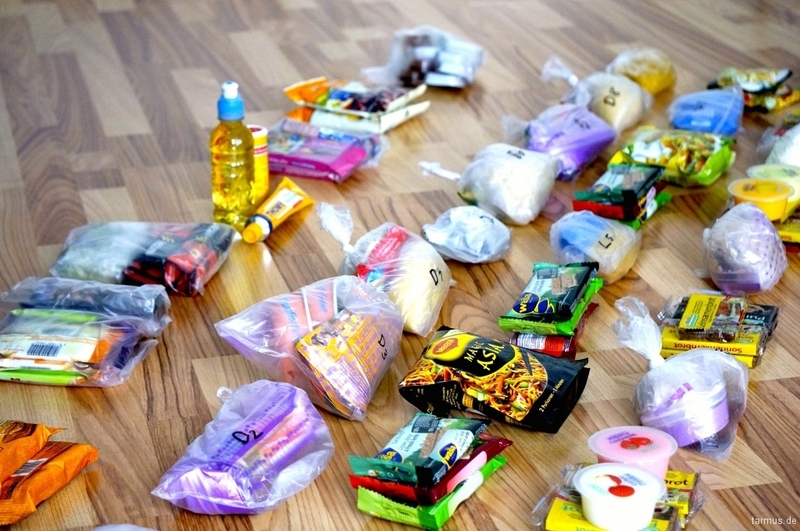 It is easy to pack spaghetti for every meal, but very boring in the end. Pasta with quick powder-sauces one day, tuna with instant mashed potatoes or couscous the next day. At home we made a porridge-breakfast-mixture consisting of powdered milk, oat-flakes and cinnamon, to wich we only added water and honey at the campsite and this was a real hit. Every meal was planned precisely and packed in bags. 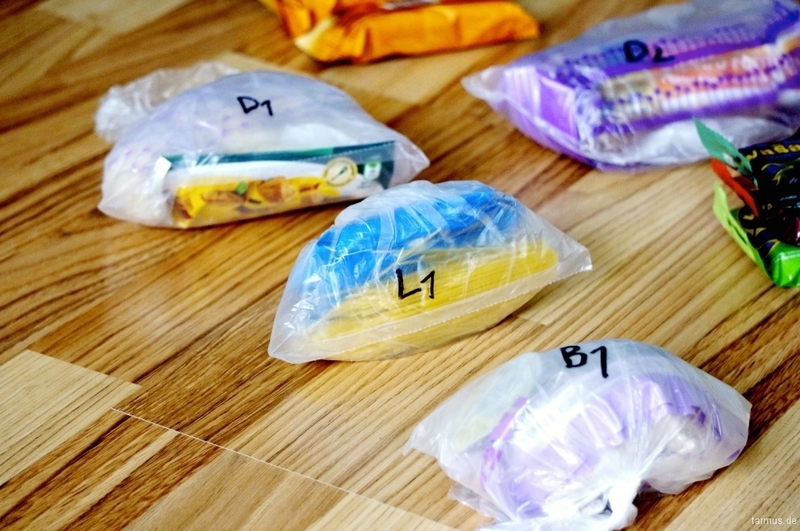 Each package was marked with B (breakfast), L (lunch), D (dinner) and a number for that day (1-9). Additionally we had snacks and bars for in between. In the following table you can get a hint of what should be in your backpack. The labels are not as important as the functionality. Toiletries Shampoo, soap, tooth paste, etc. When starting your tour in Abisko, you have several ways to get there. Off course, car is an option, but most hikers either travel by air to Kiruna via Stockholm or by train to Abisko Fjällstation via Stockholm or Narvik. Train from Stockholm to Abisko: With SJ (12,5 h), night train with sleeping-cabins.